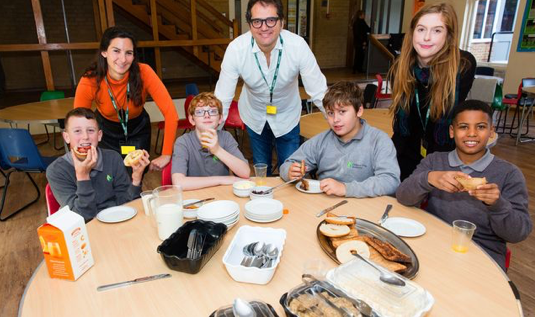 Children at Wendover's Chiltern Way Academy welcomed the team from the local Amazon fulfilment centre in Hemel Hempstead to celebrate a new funding partnership for their Magic Breakfast club. The breakfast club, founded by charity Magic Breakfast and now supported by Amazon, will provide children at the school with a healthy breakfast and start to the day. The breakfast club at Chiltern Way Academy is one of 77 schools across the UK to benefit from Amazon funding as part of the company's 'Amazon In The Community' programme, which is focused on giving all children an equal chance at succeeding in today's digital society. The Amazon team paid a surprise visit to the school, rolling up their sleeves to help dish up a healthy breakfast of porridge, bagels, cereals and fresh juice to fuel pupils for the morning of learning ahead of them. As well as a nutritious breakfast, Amazon's support is providing a specialist member of Magic Breakfast staff to work with the school to help target the most vulnerable children and build nutritional knowledge among teachers and parents.